Oral Health in Bloomington: Is It Growing In Your Mouth? Believe it or not, plaque can rear its ugly head in any Bloomington mouth – even yours – no matter how meticulous you try to be. If you have deep grooves or a receding gum line, watch out. If you are a candy-loving Bloomington resident with the proverbial sweet tooth, then you should probably come in for a checkup soon. Bacteria naturally occurs in the mouth, always will. Bacteria will try to colonize on the smooth surfaces of your teeth and will eventually start to affect your oral health in Bloomington. At first, plaque will be soft enough to be removed with a fingernail. After 48 hours, it will start to harden. Give it 10 days and it will be a substance that is very difficult to remove called tartar. 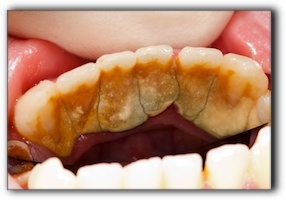 This bacteria will feed on sugars and produce acid that will eat away the tissues of the tooth and lead to cavities. Cavities will originate on the surface and spread on and through the tooth, ruining your oral health in Bloomington. The best way to deal with plaque is to have a consistent removal process such as regular brushing and flossing after eating. Doing this routine first thing in the morning can also vastly improve oral health in Bloomington. We encourage anyone in the Bloomington area who is unhappy with their smile to consider the benefits of a smile makeover. Cosmetic dentistry can seem like a significant investment, but we always tell our patients that they’ll be surprised at how affordable the cost is. Treatments and services like veneers, braces, dental implants, and even teeth whitening have become very affordable for Bloomington residents. At our Bloomington cosmetic dentistry office, you can expect to learn about cosmetic dentistry, Invisalign, same day crowns, general dentistry, sedation dentistry and any number of other dental services. Ken Moore has been serving the Bloomington area since 2001. Call 812-332-1405 to schedule a consultation.